Nantucket is the Native American word meaning "land far out to sea." Nearly 30 miles out in the open Atlantic, Nantucket has managed to retain the charm and elegance of the 1800s, when it had the distinction of being the whaling capital of the world. The population of this tiny island mushrooms from 7,000 in the winter to more than 50,000 during the summer. Nantucket offers scenic beauty: gently rolling heathlands, a remarkable diversity of vegetation, cranberry bogs, and salt marshes. With its location on the north/south flyway of migrating birds, the island is a popular venue for bird watchers. More than a third of the land has been protected and will never be built upon. 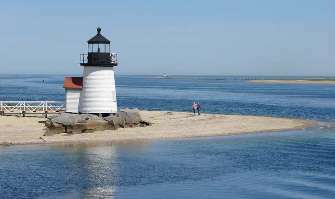 Nantucket is accessible by air or by ferry from Hyannis (and from Harwich Port from mid-May to mid-October). Bringing a car is expensive and is usually discouraged. Many visitors travel around the island on bikes or in taxis, touring vans, or shuttle buses. Visitors who do plan to bring a car are encouraged to make reservations early. More than 55 miles of broad, clean beaches encircle the island. Siasconset, Tom Nevers, Surfside, Cisco, Madaket, and Dionis are all popular beach areas with vacation homes. Madaket’s beach has been voted the region’s best beach for the past six years. 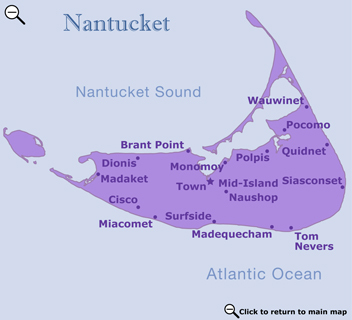 The island of Nantucket is 3.5 miles long and 14 miles wide. Its main town, also called Nantucket, exudes charm with its cobblestoned main street lined with unique gift shops, elegant restaurants, and stately homes. There are more than 800 historic homes and buildings in the town. Most of Nantucket’s historic sites are located in the center of town within easy walking distance of one another. Siasconset, or ‘Sconset as it is commonly known, is a picturesque little village filled with tiny rose-covered cottages that were once fishing shacks. Sankaty Lighthouse stands on the highest point on the island, 111 feet above sea level. Madaket means "sandy soil at the end of the land." It is a small community of cottages on the sand dunes and is famous for its spectacular sunsets. Madaket is a popular blue-fishing spot. Nantucket boasts three active theatre companies and a variety of musical organizations. The island attracts exceptional artists, and there are more than 50 art galleries. In 1996, the island hosted the first Nantucket Film Festival, a screenwriter’s festival that showcases original screenplays.